I am so pleased that there is now a very professional Spa here at MetroPark. My partner, Nanny - bless her tiny toes - enjoys a good pampering occasionally. This invariably means that I have to drop everything and drive her to the nearest hairdressing salon. Lately however, since the opening of Kaew Sirakorn Spa (catering to both ladies and gentleman), she won't hear of going anywhere else. I must admit that I was intrigued, and with camera in hand, I sallied forth. I was met by the charming Aoy, who is the manageress and she allowed me to take a good look around - and obviously some photos. I kid you not - it is three floors of unadulterated pampering. The hairdressing salon is located on the ground floor and is professionally run, equipped and furnished. This is the comfortable waiting area. In Bangkok - when you go for a haircut - the washing procedure is invariably uncomfortable - since there is usually no support for your neck. Not so at Kaew Spa! They've got highly sophisticated furnishings in the wash room making the experience both comfortable and very pleasant. The cutting room at Kaew Spa is professionally furnished and equipped. It is also staffed by very experienced personnel who will be happy to carry out your instructions. Since I am not an expert on Beauty treatments - I am at a loss to explain the services at the beauty salon. My partner, however, has given me the following - a menu, if you will. 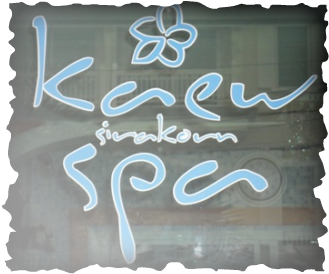 Kaew Sirakorn Spa is stocked with a huge array of beauty products. This room, apparently, is the body treatment room. According to Aoy - there all sorts of waxing services on offer. The Massage Room is extremely comfortable and spotlessly clean. It is staffed by professional Thai masseuses who certainly know their business. When you have finished your treatment, consider pampering yourself further in the Jacuzzi. The bathroom where the shower room and jacuzzi are located is spotlessly clean. Enjoy!